If you’re looking for a new truck in 2019, Chevy has a whole new lineup that is just itching to hit the job-site. If you need to haul, tow, or drive over rough terrain, these new Chevy trucks can get the job done, no matter how big. There’s a reason that Chevy is renowned for making some of the most reliable trucks in America. From the compact Chevy Colorado to the heavy-duty Chevy Silverado HD, there’s a new Chevy truck to fit your needs. The 2019 Chevy Colorado comes with your choice of three engines. The base engine is a 2.5-liter four-cylinder that can be equipped with either an automatic transmission or a manual one. This engine is both fuel efficient and powerful, delivering 200-horsepower to get the job done. If you want something with even more kick, opt for the 3.6-liter V6 engine with an 8-speed automatic transmission which delivers 308-horsepower. If you do a lot of towing and want an engine that’s never going to fail you, the mega-powerful 2.8-liter turbodiesel engine might float your boat (or tow it at least). This diesel engine produces 186-horsepower and 369 pounds-feet of torque. This engine is unrivaled by any other compact pickup truck on the class. 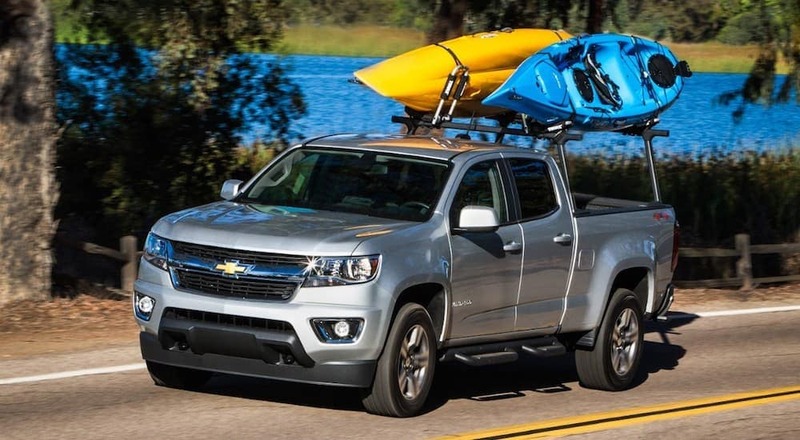 If you go with one of the base models, the 2019 Chevy Colorado gets one of the highest fuel economy ratings in its class! It gets an EPA-estimated 20 MPG city and 26 MPG highway. Even when you upgrade to a more powerful engine, the Colorado’s fuel efficiency doesn’t disappoint. With the V6 engine you’ll get 18 MPG city and 25 MPG highway. With the diesel engine, you’ll get an unprecedented 20 MPG city and 30 MPG highway! Both the Colorado Extended Cab and the Colorado Crew Cab trucks with the short box are 17.7 feet long. This extends to 18.7 feet for the Crew Cab long box models. The standard long box, measuring 6’2” is longer than many other compact pickup beds on the market. The Colorado is well suited to hauling taller things like bikes than other compact trucks due to its deeper bed. 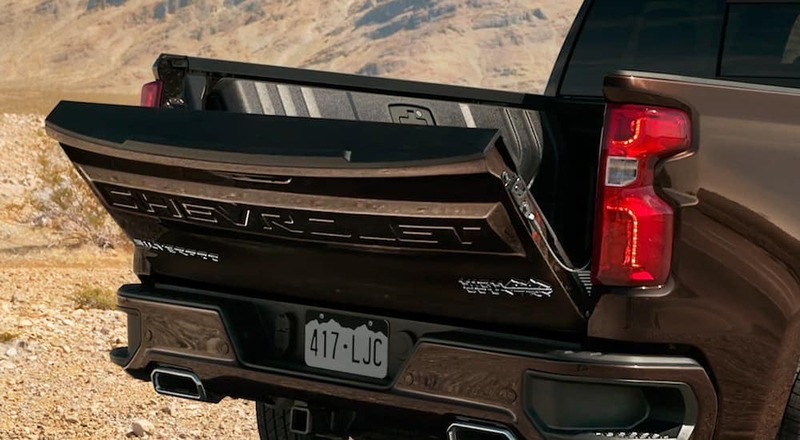 All models of the 2019 Chevy Colorado come with a locking tailgate, a CornerStep rear bumper, and hand grips which are built into the bed. You can also upgrade to get an EZ Lift-and-Lower tailgate so that you can open the tailgate with one hand. Just because this new Chevy truck is designed to work hard and get the job done doesn’t mean it isn’t a modern vehicle too. You’ll find a touchscreen infotainment system, Bluetooth capabilities and navigation standard with your new Colorado. If you want to connect your smartphone, you can with either Apple CarPlay or Android Auto. Charging is no problem with two USB ports and the display is easy to read on the 7- or 8-inch screen. There’s a reason that the Chevy Silverado 1500 is a feature on roads up and down the country. It’s reliable, powerful, and can be customized to fit the needs of whoever owns it. If you’re looking to get a new Chevy truck this year, you won’t have a lack of options with the 2019 Chevy Silverado 1500. In fact, you’ll have a whopping 5 engine options to choose from! Right now, we’re only got fuel economy ratings on the new Chevy Silverado 1500’s V8 engines, but we’re impressed. The 355-horsepower engine gets 17 MPG city and 23 MPG highway while the 420-horsepower one gets 16 MPG city and 20 MPG highway. Not bad if we do say so ourselves. In terms of towing capabilities, the Chevy Silverado 1500 is entirely capable. The max it can tow is 12,000 points while the max payload is almost 3,000 pounds! You won’t feel your truck straining when you hook up your boat or trailer and hit the road. This new Chevy truck got a slight update in bed dimensions for 2019. Now, the bed is a bit wider and deeper, meaning you can haul even more with ease! There are three bed lengths to choose from; 8’, 6’6”, or 5’8”. With the largest option, this new Chevy truck has the largest bed in its class! You can also add extra features like tie-down points, a power tailgate, or lockable bins to add convenience to your day. The Silverado 1500 has all the same great standard tech features as the Colorado, including infotainment system with its 7-inch touchscreen, Bluetooth, a USB port, Apple CarPlay, and Android Auto. It also has a six-speaker audio system (seven-speaker with upgrade), available sunroof, and available wireless charging device. These two engine options both pack a powerful punch. The Vortec engine provides 360-horsepower and 380 pounds per ft of torque while the Duramax provides an astonishing 445-horsepower and 910 pounds per ft of torque! Getting the job done is what these trucks are all about! The max bed volume for both the new Chevy 2500HD and the 3500HD is 76.30 cu. ft., making it the perfect size to haul lumber, construction materials, and all your tools to the job site. The Silverado HD features a strong and durable roll-formed steel cargo box that was designed to put up with even the toughest jobs. You can also add a spray on bed liner for increased resistance, cargo tie-downs and bed lamps, and a class-exclusive corner-step rear bumper. If you’re planning to use this truck for your job, there are a bunch of features which you can add to make your workday even better. An available factory-installed Fifth-Wheel/Gooseneck Prep Package with accessories includes a stationary toolbox, assist steps, and a hard folding tonneau cover. Whether you want to tow a huge trailer, haul construction equipment and lumber, or cruise over uneven terrain at a job site, this heavy-duty truck is ready to get the job done. Period.